I am currently traveling and hiking through Slovakia, so in the meantime, I am posting a summary of translations of Slovak meat parts to English that Miro posted previously as a set of comments. I figured that having them all organized in one place will make it easier for you to find the right kind of meat for your next Slovak recipe using the meats found in the American supermarket. It’s not easy match/translation as American cuts are a bit different and more detailed than Slovak cuts. There are groups of meats/cuts and they include more detailed cuts. You can see this meet chart for detailed American beef cut (select for instance Angus Beef Chart 2007). predná glejovka = shank cross cut, usualy used for a ground meat and stew meat. You will find a pork meet chart on the same site, after your scroll down to Pork Charts. there are many details in pork meat that are usually not used in the US cooking. Aka, “vnútornosti” including heart, liver, kidney, brain, toque, stomach, etc. They are used in “zabíjačka food” not so known in the US. Some processed parts you can find in a specialty stores. Aka tlacenka known as head cheese in the US. don’t forget some offal (vnútornosti) e.g., veal livers – telacia pecen is superior to beef liver, etc. Here is jahnacie mäso (lamb), one of my favorite. Baranina (mutton) has the same cuts, the difference is that lamb is usually a few months old sheep. Mutton is 1 -2 years old sheep. In Slovak cooking lamb cuts are the same as veal cuts. The chart for Lamb cuts is also on virtualweberbullet.com, below Pork Charts. Bio: Miro was born in December 1944 in Prague, though lived most of his live in central Slovakia while growing up. After finishing his master degree and postgraduate studies in systems engineering he worked in Systems Engineering Institute in Bratislava, doing work in software aspects of IT systems. He left Slovakia in 1978 and came to Washington DC area where he worked mostly for companies supporting the US government in IT areas. He retired in 2006 and lives in Northern Virginia suburbs of Washington DC. Miro likes to cook and to follow many traditional recipes from Slovak cuisine. I am a regular follower of your blog. If you remember, I am an indian citizen living with my family in slovakia for the past 6 years.Though i dont consume meat, i still follow some of your recepies especially cakes and bakes and you are doing a very good job while describing the recepies with pictures. also your slovak to english lessons are of great help. keep up the good work and all the best for your hiking trip,enjoy your stay in slovakia. thank you Lubos for this wonderful list of the meats. it sure helps a lot. hope you are having a wonderful and safe trip. Love your web site! However, the links for the meat cuts aren’t working (any more?). Also, my Babi used to make a dish at Easter-time called (I believe) sekanina (sp?). Do you or your readers have a recipe for it? It’s been probably close to 55 years since I’ve had it, so I don’t really remember too much of what’s in it, other than lots of eggs, probably some ham, and a couple other ingredients. And two more questions, but only one pertaining to cooking/baking. I saw the recipe for the bear paws and, as someone may have mentioned, they look similar to pracny. But my mom also called them “krapny” (because that’s what Babi used to call them). So if they’re really pracny, then what’s krapny? you should be able to access it and download it to your computer. I can’t fix the lubos site but maybe he’ll do. a tak utekal uz sem. I’ve not had any problems acessing the meat charts anytime I’ve gone to the Virtual web page thru Lubos’s links in this Slovak Cooking issue. Check your web surfing settin. You may accidently have something set wrong. I found a nursery rhyme with the English translation. Miro, thank you for effort to make a list of meat cuts. Very helpful! If you come across a chart of Slovak cuts please post it here too. Thanks again. Rado, it’s a bit difficult, I tried to search Internet for pictures of “Slovak cuts”, however found none, the mostly because they went to EU standards that a bit different from Slovak traditional. 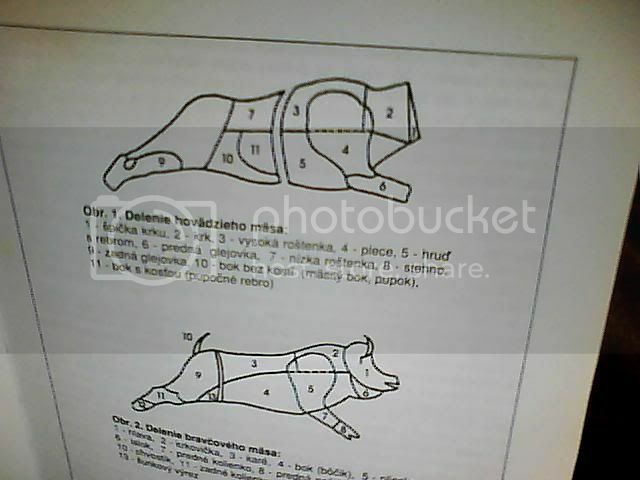 I was using my good old “Slovenska Kucharka” cookbook that had an explanation of meat cuts. Let me see how it comes out, if not good, aka unreadable, I’ll make some comments on numbers and names. Distribution and use of meat again. This is interesting. I’ve never heard the word “studenia”. I would have no idea what it could mean. I only know it by name “huspenina/aspik”. Just learned someting… Can someone tell me where do they call it “studenia”? Which region, or dialect? I think it’s the same thing as “huspenina”, which is basically this meat jelly. I was never a fan! Hello guys, can I ask you something? I started living in Bratislava and i would like to make some beef steaks fast & easy! but i can’t understand the parts of the beef (despite the chart & translation from lubos). Can you help me out? I want this kind of beef for steak in broil or skillet (like rib-eye steak). I mean what should i ask for?! because it seems to me that there are only 3-4 buckets of large meat-parts and they look like all the same to me! Thanks miro for your quick reply, i’m gonna give it a test drive tomorrow or on tuesday, i’ll keep you posted! :) hope this works !